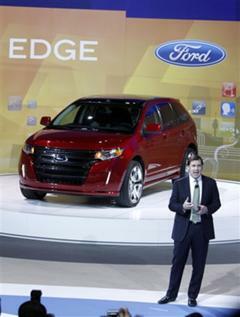 Ford Motor Co. is on a roll. Its popular new cars and trucks are grabbing a bigger share of the U.S. market. It’s about to erase a big portion of its health care debts. And Ford is adding a significant number of jobs for the first time in years. The news puts Ford, which has now turned profits for a year and a half, even further ahead of its Detroit rivals as the American auto industry slowly turns around. I think Ford has been successful as well because of their strategic advertising partnership with Amercian Idol and being heavily involved with internet marketing strategies. They are definitely one to watch in the Auto Industry and looking at their stock price levels today compared to the past few years it looks like Ford is a company to watch.